Being able to monitor several social profiles all at the same time and in the same place is very important for social media managers. Regardless of whether you have one client (set of social media profiles) or many, Hootsuite has been regarded the TOP social media dashboard, but today I introduce you to Gremln. To start with Gremln looks a lot like Hootsuite. 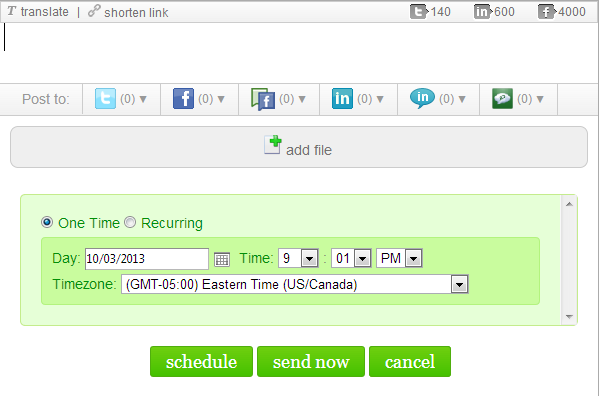 The only benefit I think Gremln has over Hootsuite is the interface, it just looks a lot more friendly. For me Hootsuite has always been dark and unfriendly. As you can imagine there are quite a few options to publishing an update. There are so many profiles to choose from, link shortening tools, translation tool, character limitations, and scheduling options. On top of having a great dashboard Gremln also sports some really nice tools that are easy to access, navigate, etc. Under Posts, you’ll find all of the updates you’ve sent from Gremln, really useful. This is comparative to setting streams in Hootsuite for seeing published posts, but you don’t have to set it up. Posts are separated by social platform. The calendar tool will show you what you scheduled for future updates. You’ll be able to edit and move posts. You can even view the calendar by day, week, month and a timeline. Upload your own header to make it look professional for your clients, add sections of the report, export it to PDF. The wizard is very easy to use- no experience necessary. Another tool allows you to make goals based on your accounts. For instance how many fans your fanpage has on Facebook, followers you have on Twitter, etc. I like Gremln, for a long time I’ve had a love/hate relationship with Hootsuite, and Gremln is a great runner up to the functionality. Obviously there are many reasons to stick with Hootsuite. You can’t beat the functionality of all of the apps they have. They also have mobile apps, that while I’m sure Gremln is going to make, they do not have now. Lately though, a lot of people have been complaining about Hootsuite (especially on Twitter) and I’d love to Gremln offer them a free trial. There are also a lot of issues with the current iOS 7 updates that are getting complaints. So, if you’ve had complaints about Hootsuite, try out Gremln, you might like it, and if we get active there, they will probably grow to give us more functionality. If you have tried it, tell me about your experiences below. This looks promising. I’ve been using HootSuite for awhile and I’m looking for an alternative and try it out with another campaign. Even though this is a few years old, this is still relevant and useful for others. I’ll share this with my friend.